Yo Kanye, I'm really happy for you, I'ma let you finish, but Nike can't keep up! : Is There A Problem Here? 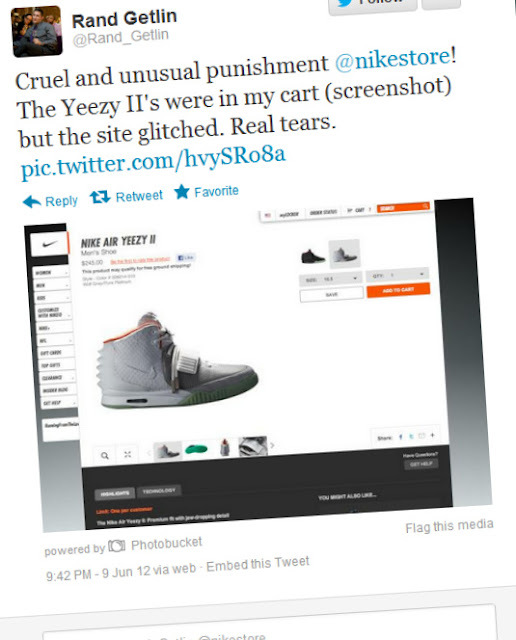 : Yo Kanye, I'm really happy for you, I'ma let you finish, but Nike can't keep up! Yo Kanye, I'm really happy for you, I'ma let you finish, but Nike can't keep up! Click here to read and post comments without scrolling all the way through the Storify tweets. Nike released the Kanye West Air Yeezy II shoes last night. It appears that it didn't go according to plan -- unless the plan was to anger fans who are willing to stay up late to buy $250 sneakers. I've assembled the following tweets from before, during, and after the release to tell the story of the release. These many tweets are displayed in chronological order and are only a small sampling of the thousands of complaints tweeted in the past day. While I have not included any of the racist and sexual comments directed at Nike (sadly, there were many), I have included tweets containing language I typically censor from this blog. I have included tweets containing foul language because I believe it helps in understanding the users. Many of these tweets seem to example David Platt's first and only rule of usability: "Know thy user for he is not thee." I suspect that most website development people are NOT people who get excited about a Kanye West Nike shoe release -- but, I could be wrong about that. What I do know is that it is important that we understand our customers as emotional human beings. Care to learn about what motivates them and what frustrates them. Don't ignore the emotional impact of software. Respect the people who support your business with their money; even when they don't respect you. Running out of stock when releasing a hot item can be expected. Giving people the impression that they've laid claim to an item and then not selling it to them is not good. I ask that you pay special attention to the effect that technology issues (and other inconsistencies) have on people's emotions. What can we software people learn from the release of a shoe? Shoes disappearing from the cart.